This month’s newsletter contains a report from the IPBES-6 Plenary in Colombia and a recent symposium on SEPLS and ecosystem-based disaster risk reduction in Taipei, which was also an IPSI collaborative activity. We would also like to direct your attention to an update on the IPBES assessment process and the latest newsletters from the COMDEKS Programme and the GEF-Satoyama Project, and to present a write-up of one of IPSI’s recent case studies. The sixth session of the Plenary of the Intergovernmental Science-Policy Platform on Biodiversity and Ecosystem Services (IPBES-6) was held in Medellin, Colombia, with activities from 17 to 24 March, and members of the IPSI Secretariat were in attendance to represent the SEPLS concept and strengthen ties between IPSI and IPBES. As background, UNU-IAS, the host of the IPSI Secretariat, signed a Letter of Agreement with the IPBES Secretariat last July, stating that UNU-IAS will, among other activities, make use of the IPSI network to offer IPBES closer access to stakeholders at the sub-national and local levels, especially in areas such as biocultural diversity and sustainable development. With this in mind, IPSI activities, in particular the recent Satoyama Initiative Thematic Review Vol. 3, were featured in relation to indigenous and local knowledge during the Stakeholders’ Day on 17 March. IPSI Secretariat staff also had opportunities for bilateral meetings with the IPBES Secretariat and several technical support units to explore further collaborations in the future including contributions to IPBES’s ongoing and future assessment work. We look forward to working with IPBES more, and all IPSI members are also highly encouraged to explore opportunities for collaboration. For more information on the IPBES-6 Plenary, please see the IPBES website here. 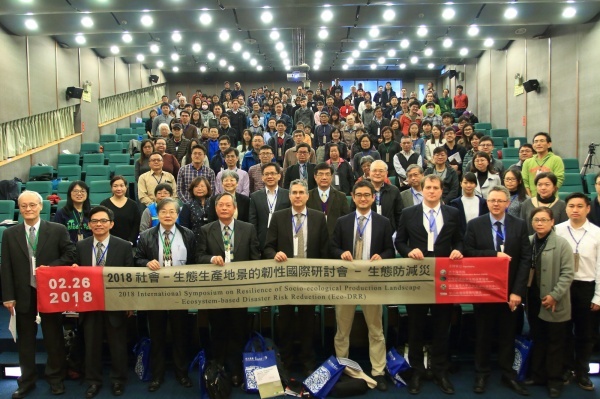 On 26 February, the “2018 International Symposium on Resilience of Socio-ecological Production Landscape – Ecosystem-based Disaster Risk Reduction (Eco-DRR)” was held at the Center for Condensed Matter Sciences of National Taiwan University in Chinese Taipei. The Symposium was organized by the Soil and Water Conservation Bureau of Chinese Taipei (SWCB), the Society for Wildlife and Nature (SWAN International), the Biodiversity Research Center of National Taiwan University, and the IPSI Secretariat, and was held as an endorsed IPSI Collaborative Activity. The IPSI Secretariat’s Mr. William Dunbar was invited to speak about “The Satoyama Initiative, IPSI, and Eco-DRR”, and emphasized the role of landscape diversity and a holistic landscape approach to resilience in avoiding and mitigating the negative effects of various types of disasters, including a number of IPSI Case Studies. Also speaking at the event were other experts on Eco-DRR and related fields from within Chinese Taipei and around the world. On 27 February, the guest speakers were also invited by SWCB and the other organizers to visit two communities in the field. The event was covered by local media including at the Central News Agency (Chinese-language only). At its sixth Plenary session in Medellin, Colombia earlier this month (see above for a report on IPSI’s participation), the Intergovernmental Science-Policy Platform on Biodiversity and Ecosystem Services (IPBES) officially approved five assessment reports, the outcomes of more than three years of work under the Platform to explore answers to key questions, including “why is biodiversity important, where are we making progress, what are the main threats and opportunities for biodiversity, and how can we adjust our policies and institutions for a more sustainable future?” The reports approved include four regional assessments, for the Americas; Asia and the Pacific; Africa; and Europe and Central Asia, and one on land degradation and restoration. IPBES has announced the reports in two media releases, one for the four regional assessments, and one for land degradation and restoration. IPSI members and friends are strongly encouraged to keep abreast of IPBES’s work and consider contributing to its ongoing assessment processes. For more information about IPBES and its assessment processes, see its website here. 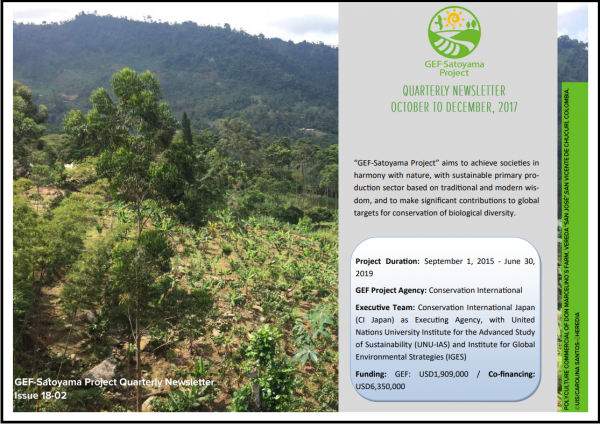 The GEF-Satoyama Project recently produced its sixth quarterly newsletter, including updates from project components and reports of the IPSI Steering Committee Meeting in October 2017 and the recent GEF-Satoyama Project side event at CBD SBSTTA-21 in December 2017. The IPSI Secretariat recently received a case study from partner organizations Forest Bureau, Council of Agriculture and National Dong-Hwa University in Chinese Taipei, titled “Facilitating the Development of a “Taiwan Partnership for the Satoyama Initiative” (TPSI), 2014-2017”. Ever since Satoyama Initiative was introduced to Chinese Taipei in late 2010, it has received great popularity from the government and the general public. Practices engaging in conservation and revitalization of SEPLS in compliance with the goal of the Satoyama Initiative are on the rise. Notably, the Forestry Bureau of Council of Agriculture had been working with universities, NPOs and local communities on ecological restoration of rice terraces and wetlands in the name of the Satoyama Initiative since 2011. Therefore, it called for a more integrated approach to setting up a national strategic framework for promoting the Satoyama Initiative in Taiwan. Learning from the experiences of IPSI, from 2014, the Forest Bureau has been working with National Dong-Hwa University (NDHU) on the development of a Taiwan Partnership for the Satoyama Initiative (TPSI). The formation of this partnership is also an endorsed IPSI Collaborative Activity.